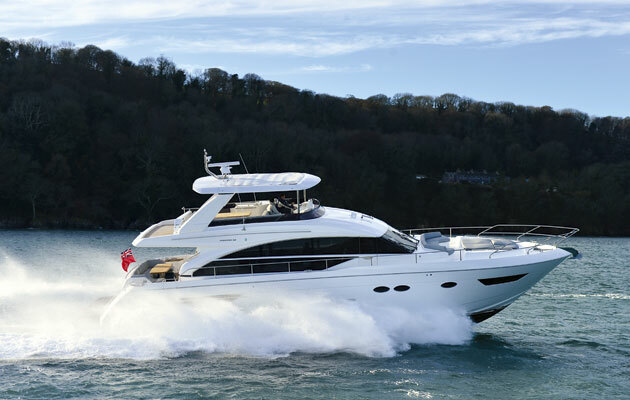 Princess Yachts is celebrating its 50th birthday in 2015. And to mark this major milestone we’ve been taking a look back at some of the company’s greatest hits. The story began on Newport Street in Plymouth in 1965. It was here that ex-Naval officer David King and two friends started a company called Marine Projects. Their first model, which was named Project 31, was built on the hull of a Senior 31 and fitted out in a rented shed. From such humble beginnings, Marine Projects made huge advances over the following years. This led to the 1969 launch of the Princess 32 – the first model to bear the name. Eleven years later the company began work on the Princess 30DS with a promising young designer called Bernard Olesinski. His name has since become a byword for the deep-vee hull. In 1984 the launch of the Princess 286 Riviera cemented this company’s status in the high-speed sports cruiser market. Its twin 270hp Volvo AQ271/DP engines gave a top speed of more than 30 knots. The V-Class range was rolled out in 1994 with the arrival of the Princess V39, which in its latest guise is still one of the company’s best sellers more than 20 years later. But wasn’t until 2001 that the company was officially renamed as Princess Yachts International, with production split over three sites in Devonport, Plympton and Lee Mill. And in 2008 a buyout by L Capital allowed further expansion, taking the Princess range over the 100ft mark for the first time. Today the largest model that Princess Yachts builds is the 40M. However, the latest new vessel to be launched is the Princess 68 – our cover star for March. But with founder David King still at the helm, there’s plenty more to come. Princess has hinted at further launches in the Flybridge, V-Class and S-Class ranges in 2015. Here’s to 50 more years! To relive the history of Princess Yachts so far, click on the slideshow above or watch the video below.